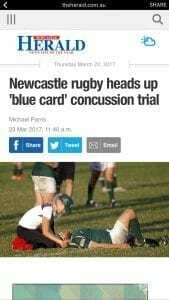 23 Mar 2017, 5:30 p.m.
Newcastle referees will have the power to sideline concussed players for 12 days under an Australian Rugby Union trial this season. The ARU, responding to growing concern about the long-term effects of head knocks in contact sports, announced on Thursday that it would trial a “blue card” system in Newcastle and Canberra rugby before rolling out the system nationwide next year. The on-field referee will have the authority to issue a blue card to “any player presenting signs of concussion”. The player must then leave the field for the rest of the match and cannot play again for at least 12 days, even if they pass a doctor’s concussion test. Juniors cannot play or train for 19 days. “As there is no gold-standard test that a doctor can do post-match to reliably diagnose or exclude concussion in their rooms, the ARU errs on the side of caution,” the governing body said. Referees can already stop a game and send off concussed players, but Newcastle and Hunter Rugby Union general manager Andy Fairfull expected it to be more common now that officials had the visual cue of the blue card and more concussion training. “It gets reported into the Rugby Link playing system . . . it’s now far stricter to get you back on the field,” Fairfull said. “They’re a little worried about the over-precautionary side of it, but given where it’s heading with law suits, and also it’s still truly unknown medically. Head knocks have been in the news after former Knights NRL winger James McManus launched legal action against Newcastle over the ongoing effects of repeated concussions. The NRL fined three clubs, including Newcastle, a total of $450,000 over their handling of concussed players in matches last weekend. Fairfull predicted the new mandated 12-day break for blue-carded players would be a point of contention for NHRU clubs. “Wait til it happens. I guarantee there’ll be uproar for days if a superstar misses out on the finals series,” he said. “But the evidence is that concussion management is the right way to go. You wouldn’t have these law suits in league if it wasn’t the right way to go. Players themselves are recognising the safety. New Zealand is introducing blue cards to all club rugby this year after a trial in 2014. Its stand-down periods are 21 days for seniors and 23 for juniors. Fairfull said the growing athleticism of club rugby players inevitably led to harder collisions. He said the increased pressure on referees to assess concussion was more a factor in junior ranks, where some referees are as young as 15. “In chatting with the referees about it, they’re probably more worried about that issue in juniors, because in seniors, if it’s a Dan Kevill, you’ve got the best referees in the zone, they’re used to being under pressure, they’re used to being criticised, getting howled at. “If you take some of these younger referees who are doing juniors and a parent starts ripping in. Their attitude to that pressure will be interesting. If we don’t get that behaviour back to the referees right, you’re cutting off young guys wanting to be referees. Fairfull said it was not practical to have independent assessors at every game and the ARU was attempting to find a workable solution. ARU medical and development staff have held seminars in recent weeks to educate NHRU referees, coaches and club medical staff on the system. “The aim is to gather feedback from the upcoming trials and work towards rolling out the blue card system nationally across our grassroots competitions at both junior and senior level,” ARU chief medical officer Warren McDonald said. 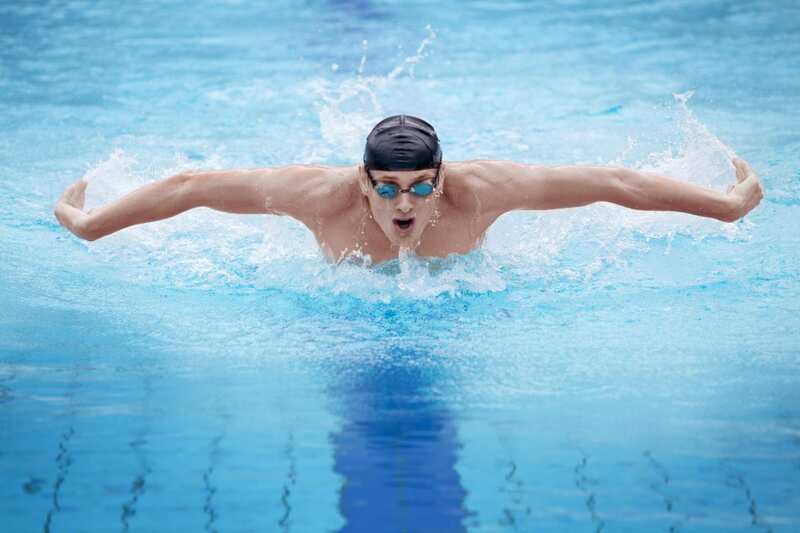 Having been a competitive swimmer in the 1980’s who suffered unresolving shoulder pain I understand the frustration experienced by swimmers who are plagued by this common injury. I am happy to say our ability to prevent and treat shoulder pain in swimmers has progressed markedly from all those years ago. We now have a much better understanding of the many factors that can contribute to this condition including training volume, loss of specific shoulder range, glenohumeral laxity, scapula dyskinesis and incorrect stroke mechanics. When these factors are thoroughly addressed in swimmers with shoulder pain many experience resolution of their symptoms. Despite this progress shoulder pain is an ongoing issue for our elite level swimmers. In a survey of over 100 of Australia’s best swimmers this year 70% reported having experienced shoulder pain with swimming at some stage, with 28% indicating that their shoulder pain was an ongoing issue, and 21% experiencing some degree of discomfort at the time of questioning. Athletes reported their symptoms significant enough to cause them to modify or stop training for a period of time and in some cases to require surgical intervention. So while we have progressed in our knowledge over the years we continue to have elite level swimmers plagued by ill-defined recalcitrant shoulder pain and there is still work to be done. Recent attention to shoulder strength balance using hand held dynamometry (HHD) is yielding interesting results and is proving to be a valuable tool for assessment and insight into varied sub-groups within the population of swimmers suffering shoulder pain, and in their ongoing monitoring and management. Previous researchers have determined that swimmer’s internal rotation (IR) strength may become excessively greater than external rotation (ER) due to the predominantly IR loading created during swimming [1, 2-5], thus resulting in a loss of humeral head control with potential superior migration, impingement and resulting shoulder pain. To investigate this further, physiotherapists working with Australia’s elite swimmers, including the 2012 Olympic team, have been performing regular HHD to examine shoulder rotation force generation with the aim of documenting strength ratios and address any imbalances if identified. HHD measurements have been made with subjects standing, the elbow by the side but not touching the body and flexed to 90°. The dynamometer was placed aligned with the ulnar styloid process on the dorsal side of the forearm for ER and the palmar side for IR measurements. Subjects were asked to brace themselves by separating their feet and bending their knees in order to avoid losing balance during testing. The force was applied gradually and increased to ‘breaking’ the isometric resistance given by the subject, and the maximum measure of three measures for each direction was used in analysis. In previous research on swimmers performed isokinetically on Cybex or Kin-com dynamometers, the IR:ER reported have varied from 1.25 to 1.62 [3, 5, 6] and as high as 1.9 , with differing results being due to variations in subject positioning and speed of rotation during testing. Using the HHD technique described we found our asymptomatic subjects on average recorded an IR:ER ratio of 1.41(+/- 0.14SD). With ongoing data collection it appears that a ratio between 1.2 and 1.6 is optimal for normal shoulder function in swimmers and if outside this range they are likely to experience shoulder symptoms. The data collected provides further evidence for the importance of addressing the causes of imbalances in shoulder rotation strength in managing swimmers’ shoulder pain. Our data indicate that as well as monitoring a swimmer’s shoulder IR:ER ratios, normalised rotation strength levels should also be calculated as they too may be predictive of injury. When expressed as a percentage of bodyweight male swimmers with no history of shoulder pain averaged approximately 30% for IR (31.4% +/- 4.3 SD and 31.0% +/- 3.8 SD for right and left shoulders respectively) and approximately 20% for ER (21.4% +/- 2.3SD and 21.3% +/- 3.3 SD for right and left shoulders respectively). In females this was slightly lower at approximately 26% for IR (26.9% +/- 3.3 SD and 25.9% +/- 3.9 SD for right and left shoulders respectively) and approximately 18% for ER (18.2% +/- 2.7 SD and 18.3% +/- 2.8SD for right and left shoulders respectively). Therefore, while a swimmer may have an acceptable IR:ER ratio their normalised strength levels may be low. Ongoing data collection and injury history suggests that normalised strength levels may be an important factor to consider in swimmers becoming susceptible to shoulder symptoms, with several of the symptomatic swimmers falling well short of these figures. Further evidence of the importance of achieving and maintaining adequate gross shoulder rotation strength has been the finding that swimmers with unilateral shoulder pain show low force production with testing on their contralateral non-symptomatic shoulder, suggestive that a loss of force on the symptomatic side was present prior to the onset of symptoms. As has been reported in past research, our testing has been able to identify individuals who produce increased IR relative to ER force during testing, indicated by a high IR:ER ratio. This relative change was seen to occur as a result of increased IR force in some swimmers, but also from a reduction in ER force production most likely as a result of posterior cuff pathology. Given the high incidence of supraspinatus pathology identified in swimmers  this has not been surprising. What has been of greater interest, however, has been the number of symptomatic swimmers recording reduced IR force measures. (See Figure 1 for example). This indicates a distinct clinical sub-group in swimmers suffering shoulder pain, and by its nature would require a management program different from that for other sources of swimmer’s shoulder pain. The reason for a reduction in generated IR force is not clear, however, it is hypothesized that it may arise as a result of training overload and fatigue, with pathology developing in the shoulder internal rotating musculotendinous structures. Recent electromyography research has shown that subscapularis can act as a major torque producer during shoulder IR  and a glenohumeral joint stabilizer during shoulder extension , the predominant movements performed during the pull phase of most swimming strokes. Subscapularis overload leading to the development of pathology would explain a reduction in IR force in an elite swimming population. Anecdotal evidence of swimmers who have ultimately undergone shoulder surgery for ongoing symptoms with identified subscapularis pathology may be further evidence for this proposed mechanism. If the loss of IR force is due to fatigue it may be possible that this phenomenon only occurs in swimmers performing large volumes of training. The current data have been collected from a group of elite level swimmers with many regularly training 50 kilometres or more per week. Therefore the likelihood of some of these subjects being susceptible to fatigue would be higher than for a recreational swimmer. Whether reduced IR force generation occurs, or is as common in less elite swimmers will only be answered with future studies examining swimmers of various levels. Several recommendations can be made from the findings of this study. First, swimmers should be routinely examined with HDD to ensure that their shoulders are maintaining an appropriate IR:ER ratio and normalised force production in their internal and external rotators. Identifying loss of force generated in either IR or ER may assist in diagnosing the source of symptoms and, therefore, implementing the most appropriate management plan. Changes in shoulder rotation ratios may be used to give direction to coaches on the appropriate swimming volume and intensity for their swimmers, particularly those swimmers with reduced IR force given that this loss may be directly workload related. Ongoing research is currently being undertaken with the AIS swim program to determine the relationship between workload and rotation force measures, which will provide further detail on the potential for us to provide coaches with this information based on our HHD measures. Furthermore, it is generally more common for clinicians and coaches to suggest to swimmers to work on ER strengthening to assist with maintaining shoulder strength balance. These preliminary results would suggest that maintaining adequate shoulder IR strength can be equally important, so dry land training should also focus on gaining strength and potentially greater ‘resilience’ within the internal rotating musculotendinous structures. How best to retrain strengths deficits of the shoulder once identified is an area beyond the scope of this article, but it is a protracted process with gains being made slowly. Again, HHD is of value by providing an objective and accurate measure with which to monitor progress. By the nature of swimming, there will always be the potential for shoulder injury. The hope is that with further examination of the value of tools such as HHD and the results of other investigations currently being undertaken with our elite swimmers, we will be better able to give direction in preventative measures to avoid shoulder injury, better predict its potential onset and provide improved injury specific rehabilitation should it occur. At this stage there appear to be encouraging signs that we are heading in the right direction. 1. Davies GJ, Matheson JW, Ellenbecker TS et al. The shoulder in swimming. In: Wilk KE, Reinold MM, Andrews JR, eds. The Athlete’s Shoulder – second edition. Philadelphia, PA: Churchill Livingstone Elsevier 2009:445-63. 2. Weldon EJ, Richardson AB. Upper extremity overuse injuries in swimming – A discussion of swimmer’s shoulder. Clin Sports Med 2001;20(3):423-38. 3. Beach ML, Whitney SL, Dickoff-Hoffman SA. Relationship of shoulder flexibility, strength, and endurance to shoulder pain in competitive swimmers. J Orthop Sports Phys Ther 1992;16(6):262-8. 4. McMaster WC, Long SC, Caiozzo VJ. Shoulder torque changes in the swimming athlete. Am J Sports Med 1992;20(3):323-7. 5. Rupp S, Berninger K, Hopf T. Shoulder problems in high level swimmers – impingement, anterior instability, muscular imbalance? Int J Sports Med 1995;16:557-62. 6. Falkel JE, Murphy TC, Murray TF. Prone positioning for testing shoulder internal and external rotation on the Cybex II isokinetic dynamometer. J Orthop Sports Phys Ther 1987;8(7):368-70. 7. Sein ML, Walton J, Linklater J et al. Shoulder pain in elite swimmers: primarily due to swim-volume-induced supraspinatus tendinopathy. Br J Sports Med 2010; 44(2):105-13. 8. Boettcher CE, Cathers I, Ginn KA. The role of shoulder muscles is task specific. J Sci Med Sport 2010;13:651-6. 9. Wattanaprakornkul D, Cathers I, Halaki M et al. The rotator cuff muscles have a direction specific recruitment pattern during shoulder flexion and extension exercises. J Sci Med Sport 2011;14:376-82. Figure 1. 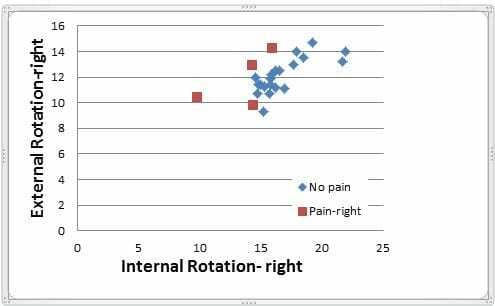 Graph of external rotation and internal rotation force production for the right shoulder of female members of the 2012 Australian Olympic swim team. Units are in kilograms. Swimmers’ shoulders were classified as symptomatic if, in the 12 months prior to testing, symptoms were significant enough to cause cessation of training for any period of time. Note the symptomatic shoulders show a greater tendency toward reduced internal rotation force production in comparison with asymptomatic shoulders. Regent Street Physiotherapy prides itself on offering high quality treatment in a professional yet friendly environment, and we adhere to the APA’s code of conduct.